Students new to Southwestern College in the fall of 2016 were invited to introduce themselves through their art and other creative processes. It is the Wild Heart Gallery‘s honor to feature a few of the contributing artists of the Lead-in exhibition. Laura’s expressive use of abstract, vibrant color schemes incorporates allegory and figurative interpretations of human, plant, animal, celestial, or imaginative bodies in order to convey an existential message about the solutions and dilemmas of consciousness. Living beings reside in impermanent body vehicles and it is this-conditionality which manifests an experiential unification of dichotomies and paradoxes such as heart and mind, Light and the absence of it, Life and the absence of it, the cultivation of emptiness, God and the absence of God, contrasts between something and nothing, being and non-being, action and non-action, suffering and the cessation of it and so on. Life and death cycles are interesting to observe during these modern times where many humans act as if Nature is a hierarchical pyramid reserving the top for humans to dominate as supreme rulers and sole heirs to conscious intelligence. Laura uses flora and fauna symbols and sacred geometric representations to share insights on how humans have manipulated and enslaved one another, other Earthly creatures, as well as exploited Earth’s natural resources in order to create power structures and systems for hoarding wealth. This seemingly human condition is an addiction and it is suffering yet there is a way out. There are as many ways out as there are in. There are as many ways out as there are humans who cause the conditions to arise as they do, as they have, and as they possibly will. Laura also uses these symbols to celebrate Life’s glorious, tenacious ability to propagate itself despite human foolery…no matter what, Nature will prevail and hope remains in the shift towards more mindful, compassionate perspectives and practices. Laura investigates relationships with the body, identity, spirituality, love and connection with others, womanhood, oppressive beauty standards, how bodies experience violence in physical and psychic realms, how we can be victims to violence and in contrast how we are in our own unique, perhaps small ways the perpetrators of violence, and how we navigate through narrow, displacing, channels of socialized structures and institutions of which we are expected to complacently live in without questioning. Subjectivity to multiple levels of harm and degradation of the body mirroring the degradation of the Earth body, to unjust laws, to addictive, abusive authoritarian figures and concepts, and the search for personal freedom within the entanglement of it all are the focus of Laura’s work. The purpose of her work is to explore pathways which lead to raising awareness to, transforming and healing systemic cultures of human violence through practices which manifest peace, well-being, and cause the rippling effects of love and good will. Through these expressions Laura sets positive intentions for her life and for all beings as she receives insights during the creative process. This process facilitates glimpses of what liberation looks and feels like for her, of what Life can be like through mindful investigation of direct experiences in the body in conjunction with the implementation of progressive endeavors which, Laura believes, will result in a heightened collective experience as well. 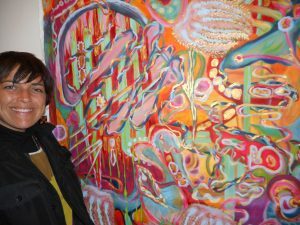 A mixed media approach, incorporating collage and found objects, three dimensional designs, and painting, allows her creative space to manifest world peace, love and healing, advocate deep respect for Nature and environmental stewardship, and to celebrate our diverse interconnected, interdependent web of Life.